New gameplay footage and details for Doom Eternal, Rage 2 and Fallout 76 were shown off at QuakeCon 2018. Fallout 76 will release in November 2018 however, there is no concrete release date for Doom Eternal or Rage 2. Doom Eternal, Rage 2 and Fallout 76 were some of the highlights at E3 2018. During the Bethesda presentation, we were told that more details will be announced at QuakeCon 2018. QuakeCon 2018 is wrapping up and we have a ton of details on the upcoming games. The reboot for Doom was released in 2016 and calling the first-person shooter awesome would be an understatement. The sequel promises to be bigger, filled with a lot more action and some redesigned weaponry. Staying true to Doom 2 (released in 1994), Doom Eternal takes place on Earth which is attached by the demons from hell. Developer id software says that there will be twice the number of demons when compared to the 2016 outing with new reimagined demons a part of the roster. The developer has also said that there will be a new way in which the demons will take damage. 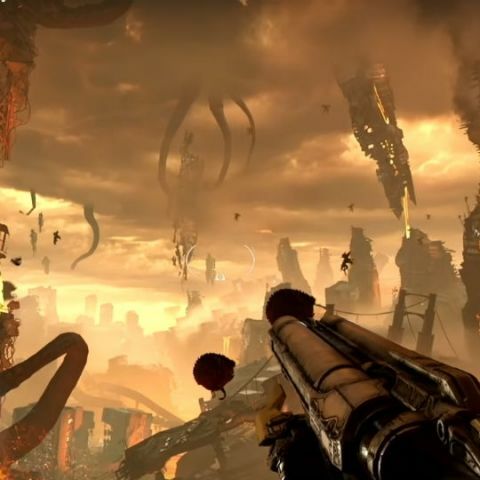 As you shoot them, you will see parts of them fall off/get destroyed to show a more organic destruction of the demons. The Doom slayer this time around has a host of new weapons and gear at his disposal. There is a new blade that sticks out of his left glove for melee combat, the ability to swings off poles to gain distance and height and a new wall climbing mechanic in addition to a grappling hook that’s attached to the double barrel shotgun. There is still no release date for Doom Eternal, but it was announced that the game will hit all platforms – the PC, Xbox One, PS4 and Nintendo Switch when it launches. Considered as one of the worst kept secret at E3 2018, Rage 2 is a sequel to a post-apocalyptic shooter from the house of id software. The video shown off at QuakeCon was an extended version of the trailer we got to see at E3 2018. The new trailer breaks down the different class of enemies that you will face throughout the game and the library of vehicles that you will be able to man. The game also showed off the arsenal of weapons and abilities that you will have at your disposal. Rage 2 will hit the PS4, Xbox One and PC in the spring of 2018. The open wilderness of Fallout 76 is one we can’t wait to explore. The launch of Fallout 76 is just around the corner – November 14, 2018 for the PS4, Xbox One and PC. At QuakeCon 2018, we got some interesting details about the game. To begin with, you will not be limited to the customizations you make to your character in the beginning of the game. You will be able to customize the look of your character at any point in the game. There will also be a card based perk system in the game which will help you level up and chose the skills you want to exploit and grow. Bethesda has also been mindful about the PvP implementation. If there is a player that takes on and kills other players, there will be a bounty on his/her head and a revenge system that lets you come back to kill your adversaries for double the usual pay-out. Which mid rage gaming laptop should be a good buy at present and continued for a few years to go?